This month’s version of The Session – a beer blogging tradition of note – is dedicated to the idea of “framing” an experience by expectation and context. The experience is beer, of course. One of the pleasures of trying exciting new beers in the company of a close companion is sharing sips in bars, restaurants and festivals. Who can resist nearly twice as many interesting beers to try and to talk about? Now and then we find that there is only one beer on the list that we both crave, but usually we make the most of one of the classic “beer geek couple” benefits by discussing our choices, sharing and comparing. What a way to learn about flavors, preferences, differences in perception… and the importance of flight-sequence! The first beer frames the second. After this, therefore somehow influenced by this. That seems to be how tastebuds like to work, not quite like the famous logical fallacy, but strangely similar, letting sequence change perception on a sensory level. This is framing like that experienced by contrast in tempo or other characteristic in music or perhaps as in a novel, with foreshadowing to color the unfolding action. The first thing beer tasters are likely to discover is that a favorite beer can taste bland if preceded by a similar but sweeter, more bitter, more roasty, more yeast-flavored or higher alcohol beer. That’s easy to notice when the flavor of the known beer is strongly committed to memory, and the contents of your glass are no secret. It’s harder in a blind tasting situation, or where the known beer is not a recent favorite. When you get to a second beer in a tasting flight that’s one you have never had before, there is no way to know exactly how the prior beer is changing your perception of the current one. 1. Milder, lighter (in flavor but not always in color) beers should be tasted first. 2. Before you go to the next beer, have a few sips of good water. 3. Before you go to the next beer, have a bite or more of bland food like bread. Salty breads, crackers, chips or pretzels are not quite as good because they change your perception of sweetness, but they may be better than nothing for resetting your palate. 4. Before you go to the next beer, use a trick from experienced Beer Judges and smell your own clean shirt sleeve, resetting your ability to get the aroma of the next beer. This can look a little odd, but it works like a charm. Best if you use unscented laundry detergent, of course. 5. Just take a few minutes to rest your senses before tasting a different beer. Easier when you are not sharing sips, perhaps. A few more strategies that we have come across accidentally may be interesting to play with. If you share beers, try to have more than one sip before swapping back. Sometimes “just a taste” gives a bad impression, but swapping back after several sips can make your original glass seem like the odd one. That’s not ideal either, but at least it’s instructive. After a while you’ll start to get an instinct for what beers not to order together. 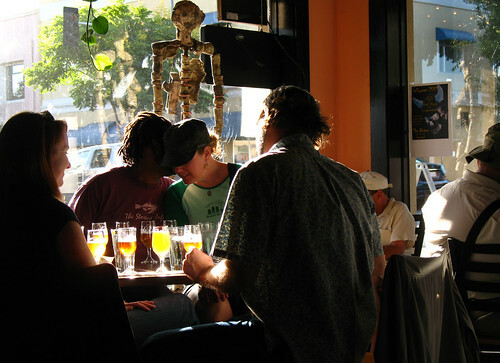 Recently Steve and I went into Toronado and saw Bony Fingers and Publication on the list, and wanted those two. I had a little trepidation looking at the two beers, since I was not sure which one should go first. Both are complex and unusual treats. Bony Fingers from Moonlight Brewing, one of the very special small breweries in our area, is a Halloween seasonal that has some of the delicious dark French-roast coffee-like malt character of Moonlight’s Death and Taxes, their popular innovative robust dark lager, with added spooky hop complexity. Publication, from Russian River Brewing Company, is a delicate Brettanomyces-fermented beer, dry but with creamy impressions of malt sweetness, not sour or funky, but with layers of earthy aged leather character from that unusual yeast, with a hop presence, but nothing like that of Bony Fingers. Flavors from a whole other universe! Which one to taste first? Turns out it didn’t matter! For us, those two seemed to each set up the other one by a fortuitous contrast that worked better than a clean slate. Like picture frames for sensory painting. Last winter after trying some barleywines, (the big boozy malty sweet granddaddy of beers from the British and American brewing tradition), we ordered two sour beers at a bar in the LA area, and the milder one was blown away by the more intensely sour beer. We knew the milder sour beer we had ordered — La Folie — was one we’d liked before, so we sat waiting to get the busy bartender’s attention for some water. No luck, but there was the rest of that sweet, malty barleywine still sitting in the glass from our prior sampling. Sure enough, that barleywine reset our tastebuds so we could experience the milder of the sour beers and enjoy it. Again, beers were preparing our palates for other beers though contrast. Sometimes an unusual sequence is not odd, but inspiring. One of our favorite local festivals offers great chances for fortuitous contrasts. The Bistro, easy walking from the Hayward BART station, has slated their much-anticipated Barrel Aged Festival for November 14, 2009. They promise 70 beers, some of which you will never see anywhere else, along with live music and BBQ from 11am to 7pm. For us, this annual festival is one of the joys of living in the Bay Area. Savoring so many contrasts of beer in bourbon barrels, in wine barrels with tart sourness, in clean vanilla flavored oak barrels and more is a rare treat. That moment of discovering contrasting beers that pair to frame one another perfectly is even more fun than beer and cheese pairing. With all due respect, Roy, I just returned from Baltimore Beer Week. At the Real Ale Fest at Pratt St. Ale House, there were many folks who used the dump buckets so we could sample as many of the 40+ ales as possible. You have a great beer scene in Baltimore.